Pinellas Park, FL, March 2, 2016. Davidoff of Geneva USA is proud to announce the unveiling of its Exclusive 100th Running of the Indianapolis 500 Cigar. Known as the Greatest Spectacle in Racing, the world’s largest single day spectator sporting event will be celebrating its 100th Running of the Indianapolis 500 on May 29, 2016. The cigars will celebrate tradition, a fundamental legacy of both brands. Blend Bar with Davidoff Cigars of Indianapolis, IN has been named the sole U.S. distributor of the cigar. The very first running of the Indianapolis 500 was on May 30, 1911 and was won by Ray Harroun. The 100th Anniversary of the race was celebrated in 2011 while the 100th Running of the Indianapolis 500 is being celebrated in 2016 due to the cancellation of races during World War I and II. Anton “Tony” Hulman, Jr. was a businessman from Terre Haute, IN who bought the Indianapolis Motor Speedway in 1945 and brought racing back to the famous race course following World War II. Hulman married Mary Fendrich, the daughter of Evansville, IN cigar factory owner John H. Fendrich, in 1926. Their sole grandson, Anton Hulman “Tony” George, would carry on the family’s racing tradition. Zino Davidoff was born on March 11, 1906 and was the eldest of four children born to tobacco merchant, Henri Davidoff who opened his own tobacconist shop during 1911 in Geneva, Switzerland. Zino took over his parents’ shop around 1930 and eventually sold the shop to the Max Oettinger Company in 1970. Zino stayed on as Davidoff’s ambassador until his death in 1994. The Max Oettinger Company was founded in 1875 and was one of the first importers of Havana cigars to Europe. Young added “Cigars have been a tradition for the families of both organizations and we are very excited to unveil the Exclusive Davidoff 100th Running of the Indianapolis 500 Cigar, an exclusive cigar blended to commemorate the 100th Running of the Indy 500.” It is available for order at Blend Bar with Davidoff Cigars (www.blendbarcigar.com). Featuring an Ecuadorian Habano wrapper, Dominican Binder and Dominican fillers, the complex blend is medium-full bodied, effortlessly capturing the perfect proportions of Ecuadorian and Dominican tobaccos. The expertly crafted blend features three aged Ligero tobaccos, with notes of cedar, spices and wood throughout thanks to the 56 ring gauge and Piloto Seco tobaccos. Each cigar will carry a second ring of the checkered black and white flag used during the Indy 500 to coronate the winner of the Greatest Spectacle in Racing. In addition, the second band will carry the insignia of the 100th Running. Only 1,000 wooden boxes, each containing ten cigars, have been crafted in an elegant white design, numbered from 1 – 1,000, to recognize the exclusive nature of this year’s 100th Running of the Indianapolis 500. 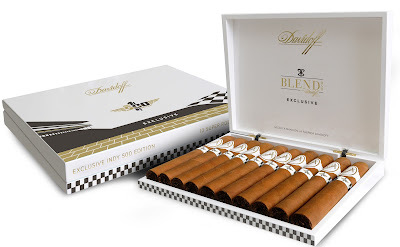 After its launch in the US in March 2016, the cigars will be available for order to cigar aficionados through Davidoff’s only licensed cigar bar and lounge in the United States, Blend Bar with Davidoff Cigars (www.blendbarcigar.com) headquartered in Indianapolis, IN.